Welcome to the first of what I hope will be an ongoing situation here at TCC. I would like to start spotlighting some of the self published authors that I have been reading and meeting on the internet. To let you get to know them, and help them get the word out about their books. 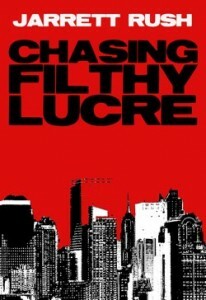 One of the first self- published ebooks I picked up for my Kindle was the novella Chasing Filthy Lucre by Jarrett Rush. It was a really great and entertaining read. I love the gritty, cyberpunk feel to it, and it has a great pace. I have been getting to know Jarrett a little through the Twitter based writing group #pubwrite. Being the stand-up fellow that he is, he agreed to answer some questions for me.